Alibaba, the Chinese e-commerce conglomerate that made the biggest IPO in U.S. history last September, had over $30 billion wiped from its market capitalization in two days ending yesterday. That was just after it got into a rare public brawl with a Chinese regulator, an apparent signal that its political fortunes have shifted decisively under the Xi Jinping administration. The hit to Alibaba’s share price corresponded with some worse-than-expected earnings, but a dispute between a major Chinese company and the regime itself is rare indeed in China, and was enough to spook investors. It is disconcerting to investors that the Chinese government is the one telling Alibaba that it has merchandise that may not be authentic. He was referring to a white paper published on Jan. 28 by the State Administration of Industry and Commerce, one of the main regulators for listed Chinese companies. It blasted Alibaba for selling fake goods and a spate of other violations. Alibaba struck back with a staunch defense and plans to personally sue for defamation Liu Hongliang, the head of the network supervision department of the SAIC, responsible for the announcement. Ties between business and politics are ubiquitous in China—especially in high-profile companies and major initial public offerings. And Alibaba, whose total revenues sat at 52.5 billion yuan ($8.46 billion) in the year ending March 2014, is the largest e-commerce firm in China—it’s often called the equivalent of Ebay, Amazon, and Paypal rolled into a single enormous conglomerate. It’s widely understood that, in China, a single company can only find itself in such a powerful position by being in the good graces of the right people in the Party apparatus. The converse of that, of course, is that being lined up with the wrong clique can spell deep trouble. So who was Alibaba mobbed up with in the Chinese Communist Party? The grandson of former Communist Party boss Jiang Zemin, for one. Alvin Jiang (Jiang Zhicheng in Mandarin) and his private equity firm Boyu Capital led a 2012 round of funding for Alibaba to repurchase half of Yahoo’s ownership stake in the company, which at the time stood at 40 percent. Boyu, and the investment consortium of which it was apart (including other connected financial firms like China Investment Corp) put together over $7 billion in that deal, and ended up with a 5.6 percent stake in Alibaba for their trouble, according to a Reuters report about the matter in 2014. At the time Alibaba was worth close to $40 billion, whereas its market cap on IPO day was $230 billion—representing a nearly 600 percent gain for those shareholders. 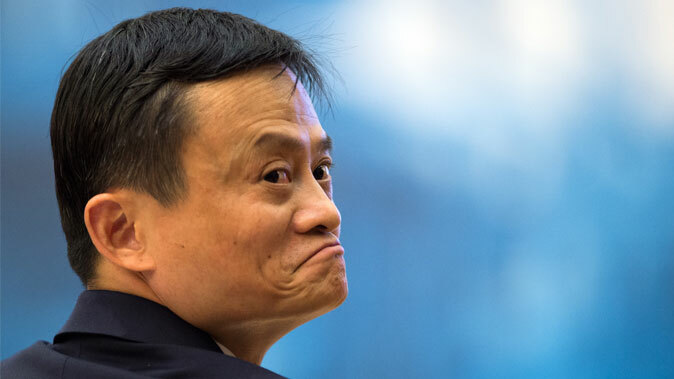 Jack Ma, the CEO of Alibaba, has always been confident in his relationship with the Chinese authorities, though he publicly downplays its importance. A company that had ties with the grandson of an unpopular former Communist Party leader. Observers of Chinese politics will see the common element in Alibaba’s recent troubles, though: the cosy ties to Jiang Zemin, a Party godfather who, through a network of allies and cronies, cast a shadow over politics in the country for nearly a decade after he formally stepped down as Party head in 2002. Since taking power Chinese Communist Party head Xi Jinping has targeted Jiang’s allies in a two-year long, ongoing anti-corruption campaign. Zhou Yongkang, the recently-purged security czar, for example, was long a Jiang client; as was the former Politburo member and his co-conspirator in replacing the Party’s pro-growth status quo with a kind of neo-Maoist political violence, Bo Xilai, who is now in prison. Xu Caihou, the former vice-chairman of the Central Military Commission—a position which made him the second most powerful military official in the country—was yet another Jiang Zemin appointee whose purge came as a shock to political circles in China. It would be as though President Obama announced, with little elaboration, that Robert O. Work, the Deputy Secretary of Defense, had been found to be corrupt and was taken away the same day, never to be heard from again. The extent of Jack Ma and Alibaba’s ties with Jiang Zemin’s political group is unclear—but along with Boyu’s prominent fundraising assist, a Boyu subsidiary, Athena China Limited, has its fingerprints over the company’s IPO prospectus. The document says that Athena China Limited, incorporated in the British Virgin Islands, is controlled by Prosperous Wintersweet Limited, also incorporated in the BVI, which, in turn, is a subsidiary of Boyu Capital Fund I, L.P.—registered in the Cayman Islands. The abstruse entanglement of interlocking shell companies makes it difficult to know exactly who owns what of Alibaba. It is clear, however, that the offspring of the Communist Party’s former leadership had extensive skin in the Alibaba game. An investment firm run by the son of former premier Wen Jiabao, Winston Wen, also controlled shares in Alibaba; so did China’s sovereign wealth fund Citic Capital, and the state-owned firm CDB Capital, whose vice president at the time of the investment, He Jinlei, is the son of the former anti-corruption chief He Guoqiang, according to The New York Times. Then there was the loan by China Development Bank, also state-owned, of $1 billion to Alibaba as part of the September 2012 fundraising round that Boyu was involved in. Chen Yuan, the son of former Party economic patriarch Chen Yun, headed China Development Bank at the time. That a Chinese company with such an enormous roster of interest among the ranks of the former leadership—heavily represented by Jiang Zemin-era personnel—would be openly hit by a Chinese regulator indicates that the political sea change under Xi Jinping is only deepening.